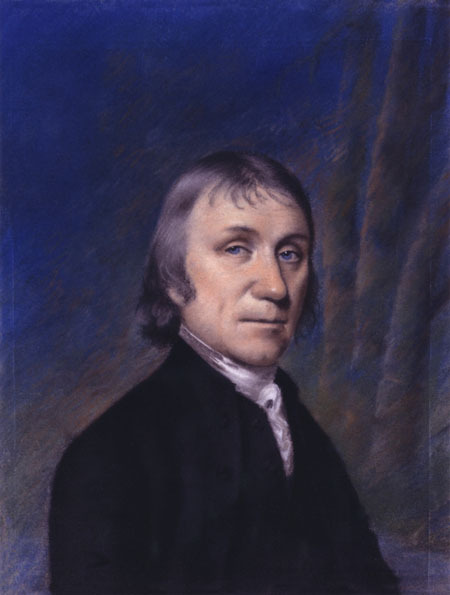 Priestley was born on March 13, 1733, near Leeds, England. Orphaned while young, he lived with his aunt who enrolled him in a rigorous school. He excelled in languages and went on to divinity school at the Dissenting Academy in Daventry. In 1761 Priestley taught at the Warrington Academy in Warrington, England. He instituted a curriculum incorporating science and modern literature that replaced a traditional syllabus based on classical readings. Priestley was deeply religious and his religious beliefs played a prominent role throughout his life; his ideas evolved from his family’s Calvinist beliefs to unorthodox interpretations of traditional Christian doctrine. In 1762 he was ordained as a minister in the Dissenting church, a group of denominations (including Presbyterian) that opposed the Church of England. Priestley met American scientist, inventor, and statesman BENJAMIN FRANKLIN in 1766. It was this meeting that catalyzed Priestley’s interest in electricity, one of Franklin’s main areas of study. The discussion with Franklin resulted in Priestley’s first published science book, History of Electricity, in 1767. During this time he became a member of the Royal Society because of his findings on electricity. Priestley then focused his research on gases and their properties. At a nearby brewery, he noticed that certain gases were given off during fermentation, which led to his work with carbon dioxide. He identified its fire ­extinguishing capabilities and found that it could be dissolved under pressure in water. Thus soda water was invented. He also studied the air quality around factories. Drawing on his previous work in electricity, Priestley found he could initiate chemical reactions that released gases. By sending electric charges through various compounds or by heating them, he isolated many new gases. Previously only three gases, hydrogen, carbon dioxide, and air (thought to be an element at that time), had been described, but during his lifetime Priestley identified nitrous oxide, sulfur dioxide, hydrogen chloride, and ammonia. His use of a pneumatic trough in the early 1770s enabled him to collect gases released during reactions. He substituted mercury in the trough to capture gases that were soluble in water. In 1774 Priestley began experiments that led to his discovery of oxygen. He used a magnifying lens to heat a mercury compound. It gave off a gas that bubbled through the liquid mercury into a glass tube. This new gas had several fascinating properties: it made a glowing splint burst into flame and it was given off by plants, a fact he recognized by doing experiments in closed containers of normal air. Other research demonstrated that this gas was beneficial to animals since they lived twice as long in closed vessels of this new gas than in ordinary air. He calculated that his new gas made up one fifth of the atmosphere. He called this new gas dephlogisticated air since it seemed to lack phlogiston, a particle scientists at the time believed was an essential component for combustion. His new gas was later renamed oxygen. Priestley’s political and religious views were as inflammatory as his newly discovered gas. He was forced to leave England and moved to America in 1794. He continued his research and found two other gases, nitrous oxide and carbon monoxide (1797). Priestley died on February 6, 1804, in Pennsylvania. Priestley’s isolation and identification of oxygen and other gases provided scientists with clues about our atmosphere and combustion. During his lifetime Priestley’s influence was widespread. His discovery of soda water initiated a craze throughout Europe for the carbonated beverage. The refinements of the pneumatic trough enabled other researchers to capture water ­soluble gases for nominal equipment costs, helping to demonstrate that sound experimental techniques did not require enormous amounts of expensive equipment. His addition of 10 more gases to the catalog of known substances dramatically furthered the study of chemistry by demonstrating that substances like ammonia can exist in both liquid and gas form. Priestley also connected chemistry and electricity, spawning a new branch of science, electrochemistry. But it was the discovery of oxygen that made the biggest impact. It provided other scientists, namely French chemist ANTOINE LAVOISIER, with the key to understanding combustion, which requires oxygen. Lavoisier’s careful experiments found that combustion occurred only when oxygen was present. The foundation Priestley laid for understanding the cycle of oxygen and carbon dioxide in living things eventually led to the contemporary knowledge about vital processes in the environment. Priestley’s legacy can be seen in many areas today. The discovery of hydrogen chloride gas paved the way for the development of products and applications based on chlorine, including bleach and chlorination. Chlorination currently provides safe drinking water for millions of people around the world. His air­quality testing is critical to our management of air pollution. Also, huge business conglomerates are based on his technology of carbonating water.